Is your toddler heavier than Nicole Richie? 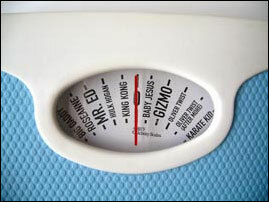 In an age when everyone compares themselves to celebrities anyway, why not bite the bullet and pick up the Celebrity Weighing Scale–a scale that does away with those pesky numbers and compares your weight directly to that of well-known celebs (both human and animal). Looking at the dial, this product may be somewhat out-of-date. (Does anyone really care what Oliver Twist clocked in at?) A more technically advanced version that could track celebrity weight in real time might improve sales of this thing. In any case, it’s available at The Angry Store for 35 Euros plus God knows what-all in postage. Via Cool Hunting.